7) Tomorrowland Transit Authority PeopleMover – Another great option to enjoy in Tomorrowland when the crowds are heavy brings guests on a bird’s eye tour of the area. 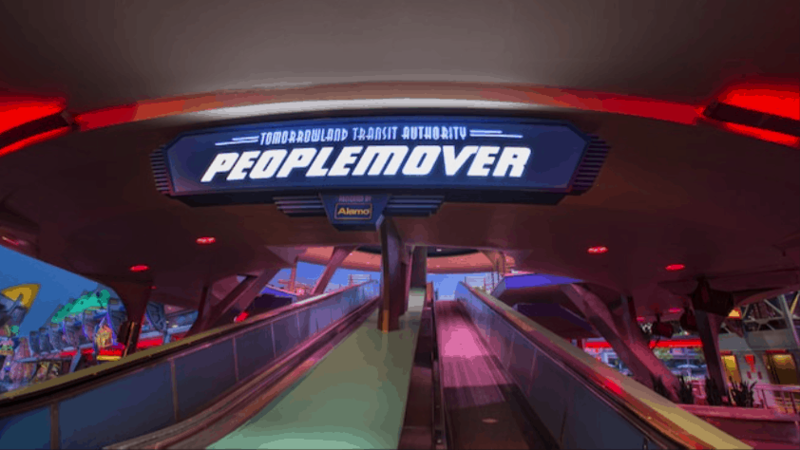 The Tomorrowland Transit Authority PeopleMover is centralized at Rocket Tower Plaza and guests can head up a moving platform to the loading area above. Each car allows guests to sit either facing forwards or backwards and quickly sets off on its open air track. The Tomorrowland Transit Authority PeopleMover is powered mainly by the push and pull of magnets embedded in the tracks and brings guests along the highway in the sky which winds its way through every corner of Tomorrowland and eve offers views of Cinderella Castle and the hub. Guests who enjoy the breeze on this relaxing attraction can also catch glimpses of Mickey’s Star Traders, Space Mountain, and Buzz Lightyear’s Space Ranger Spin. Crowded days in the Magic Kingdom are the perfect opportunity to enjoy a ride on this attraction as it is constantly loading and moving, making a lengthy looing wait time pass in mere minutes.